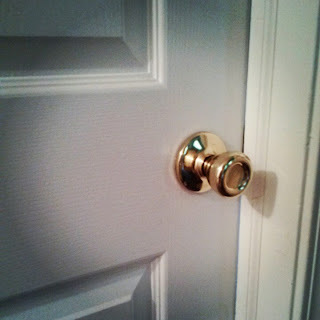 So we started with the door furnishings, at the time they were brass & I followed a couple blogs and found a great tutorial on using Rusteloum to spray the door hardware a bronze color. Tadaaaa. It worked and looks great here is a picture. This is not the actual before picture ); we forgot to take one but similiar. It was so easy. I really wish I could find the blog that gave me this awesome idea. Basically all you do is take off all the hardware like everything. We used a card board box and stuck everything thru it like to hold it up and then used the Rust-Oleum to spray follow the instructions on the can. Then put everything back on. (: It was so easy and saved us about $500 to replace with what we orginally wanted.